All teeth will gradually move back to where they started without retainers. Wearing a secure device like Vivera can help keep teeth in place after they’ve been straightened with traditional metal braces or clear braces like Invisalign. 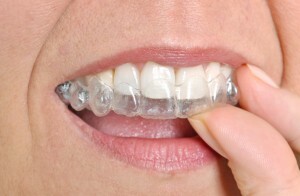 Retainers help you protect your smile investment. Ok, so you’re convinced you need a retainer — but why do you need a Vivera retainer? It’s simple — they’re custom made for you using the same state-of-the-art material used for your original Invisalign aligners. Compared to other retainer materials, Vivera is 30 percent stronger. That means there’s less risk for breakage, and the retainer is a more durable device overall. The amount of time you’ll need to wear your retainer will depend on how severe your orthodontic problems were to begin with. Often, patients start out with wearing the retainer for 12 to 22 hours a day immediately after their treatment is complete. Most can move to wearing the retainer only at nighttime after just six months of proper use. Some patients are disappointed to learn they need to wear a retainer following their orthodontic treatment, but Vivera is just as discreet as the Invisalign trays — and using it as directed will ensure you enjoy your new, beautiful smile for a lifetime to come. How do I take care of my Vivera retainer? It’s as important that you keep your Vivera retainer as clean as you did your Invisalign aligners — but because you wear your retainer for less time than during your orthodontic treatment, you’ll probably find that it’s easier to keep them clean. To prevent bacteria buildup that causes dental problems, use the same methods that you did with your Invisalign trays. Be sure that you’re brushing your teeth and the aligners before every wear. How can I get a Vivera retainer? If you’d like to protect your orthodontic investment by keeping your teeth in proper alignment for years to come, don’t hesitate to get in touch with your Costa Mesa dentist. Dr. Jorgenson will be happy to discuss your options and fit you with a comfortable, subtle Vivera retaining device. Schedule your appointment today!